Edison on cabinet right after unpacking. Note the damaged veneer and other areas requiring repair. For as long as I can remember, the ~ 3.5’ high x 4’ long crate sat beside the basement staircase in my childhood home in Windsor, Ontario. Covered in thick corrugated cardboard and bound by metal bands, there were no visual clues as to what it contained. Over the years, however, I was told that inside was a phonograph that my maternal great-grandfather owned and had passed down to my grandfather who then decided to pass it on to myself. The family lore was that the horn was missing so eventually one would have to be found. When I moved out of my parents’ house at age 20, the crate remained an unopened childhood memory. Years later, after my father’s death and the house had been sold, my Mom moved to a condo in Toronto that did not have any storage space so the movers, on the way to delivering her stuff, dropped the crate off at my place. While curious to know what was actually inside – and despite not liking the aesthetics of the musty old crate – I was a little overwhelmed with the idea of unpacking it, getting it cleaned up and making it operational. Where would I even start with fixing an antique phonograph? It’s not like National Sound (my go-to place for turntable repairs in Toronto) would be able to assist. And so there it sat, taking up space, for another year and a half. Then, in early 2015, I decided it was time to get my house in order and soon it was, with the exception of the crate. Finally, during the long May 24th weekend, I determined it was time. In hindsight, having another person around to assist would have been handy but, for whatever reason, I couldn’t wait another hour – despite the fact the crate had been unopened for decades. I laid some old sheets on the floor and got to work. After removing the top, I had my first glimpse of the crate’s contents. Taking up about 2/3 of the box appeared to be some sort of wooden cabinet. The other thing I noticed was a wooden horn which was surprising based on the limited information about the crate that had previously been passed down to me. 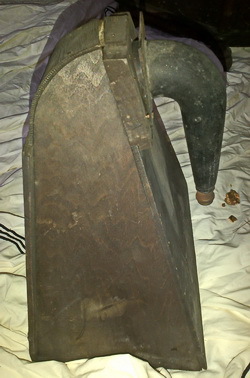 After removing the horn, which was resting upon a piece of cardboard, I saw a large wooden case with a rounded top, presumably the phonograph itself. It had been packed vertically and was resting on one end. (Later I was told that, thankfully, the brake was off and it was unwound, which potentially saved its internal mechanism from incurring serious damage.) It was unexpectedly heavy, as I moved it to a nearby coffee table, and then returned to remove the rest of the packaging. The wooden cabinet was the remaining piece, so I moved it onto one of the bed sheets and tried to figure out what I had in front of me. On opening the door of the cylinder cabinet for the first time. An idea of the initial condition of the crate’s contents and the restorations needed. The cabinet was beautiful, particularly its reddish brown colour, but was understandably filthy and needed woodwork. Obviously the phonograph was meant to rest on top of it so that’s where I placed it. As I stepped back to admire it all, I noticed a brass keyhole at the top of the cabinet front – the door could be opened, so I stepped forward and opened it. Of all the memorable phonograph-related experiences I’ve already had in these past few months, opening the cabinet for the first time remains my favourite – it was the ‘Raiders of the Lost Ark’ moment of my lifetime. As the door swung open, I saw three shelves attached to the inside of the door with another two inside its body. 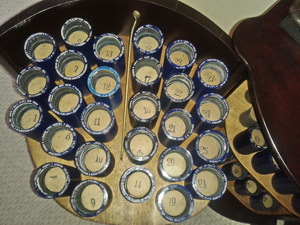 On each shelf were approximately 30 prongs, with about 60 of these holding a blue cylinder: my great-grandfather’s music collection! As a huge music fan myself, this was thrilling and for the first time I began to feel a connection to the man who was ultimately responsible for all of this coming into my possession. In the cabinet I found a radio license from the Department of Marine Radio Branch made out to J. Robinson for 1935-1936 (“This license MUST be kept available for inspection.”) and a piece of cardboard holding 2 or 3 little brushes – there was room for about 20. The cardboard was faded but I made out “The Record Sweeper. For Cleaning All Disc Records Old and New. Put it in the sound box just as you would a needle. Let the machine do the work. 10 c”. I instantly thought of the record cleaners that I use today when I listen to my own vinyl. I removed some of the cylinders. Each prong had a number written on a cardboard cap that had been glued down – in one or two cases, the cap came off when I removed the cylinders. Most cylinders were covered in grime but the white lettering on the rims of some made the titles easy enough to read. A few titles and artists were recognizable but I hadn’t heard of most of them. More than ever, I hoped that I would be able to get the phonograph to work so I could listen to my great-grandfather’s musical choices. Close-up of the Triumph after unpacking crate’s contents. Examining the phonograph, there was an ‘Edison’ decal on the front. I removed the lid and had another ‘wow’ moment. Even to my untrained eye, things looked to be in good shape, pretty dirty but all in all, it looked good and I found it fascinating. To be honest, I had never really thought that much about antique phonographs and how they worked. Certain things were obvious but I had lots of questions. Despite turning the wooden horn in every conceivable direction, I couldn’t figure out how it connected to the player. I was also expecting there to be a winding handle but was disappointed not to see one. 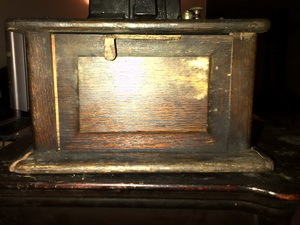 I noticed that the base-plate of the phonograph could be opened, like a music-box. What did the underside of the mechanism look like and was there was anything else inside? Maybe the handle was in there. Looking underneath the plate, I was impressed by the intricacy of the mechanism. For some reason, I thought it would be less mechanically sophisticated than it appeared. Inside the box was a number of other pieces: a box that read “Voice Reproducer”, a couple of metal containers that looked like miniature milk bottles and some other parts. And a lot of what looked like metal shavings inside the box, but the mechanism didn’t show any broken metal or grounddown surface that could have produced these shavings. Edison top view after unpacking. Flakes or metal shavings visible inside the case. Next came a moment that would bother me for weeks and that I immediately wished I could rewind and do over. After I had finished looking at the mechanism, I tried to lower the base-plate but wasn’t able to. Had the wood warped or had I somehow damaged the machine so that it wouldn’t close properly? I continued to try and lower it and heard a cracking sound. Now, not only would the lid not close but the wooden frame had started to separate in the back and was standing awkwardly. Of course, further attempts to close it made things worse – eventually the top, still connected to the back panel like a big ‘L’, detached from the rest. Within the first two hours, I had damaged a machine that had been resting safely for close to 50 years. I was furious with myself and prayed that I hadn’t damaged it irreparably. What to do next? First an antique restorer to repair the broken veneer, broken back foot and do a general cleaning of the cylinder cabinet. I looked into a number of local companies and decided on Carrocel who soon after came by and picked the cabinet up. (Two weeks later, they brought it back, in beautiful condition. They were also able to provide a working vintage key, allowing me to lock the cabinet door). Next up: the phonograph. 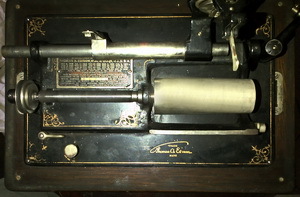 Through on-line searching, the phonograph appeared to be an Edison Triumph. One search result stood out over the others – the Canadian Antique Phonograph Society (CAPS), whose website listed Mike Bryan as President and gave his e-mail address. I sent him a note to see if he might be able to help and sure enough, he replied the next day. Through some photos I e-mailed, Mike confirmed that I had an Edison Triumph Model B, made in 1906-1908, and that it had been converted to play both 2- and 4-minute cylinders. The Triumph’s case was oak and the cabinet was mahogany. Mike also solved the mystery (to me, at least) about the horn: this was an internal horn’ taken from a later cabinet-style machine. My Triumph would require a crane and an external cygnet horn. Showing the damage to the Triumph’s case after I was unable to close it properly. Note the gap between the side and back plates. Thanks to Mike, I had a much better understanding of what I had in my possession. 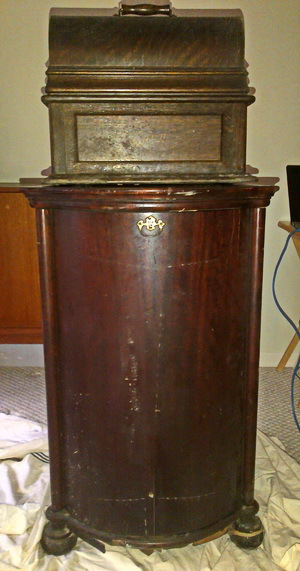 Even in their dirty and non-working states, the phonograph and cabinet were interesting pieces. I was excited to learn more and hoped to figure out a way to get the Triumph cleaned up and working. Mike then was the first to do what other CAPS members have subsequently done – graciously invite me into his home to answer my questions. Mike gave me a tour of, amidst other things, his amazing collection of phonographs. Absolutely beautiful machines in incredible condition, vibrantly colored – I hadn’t previously considered the multitude of makes, produced from so many countries and spanning both the nineteenth and twentieth centuries. 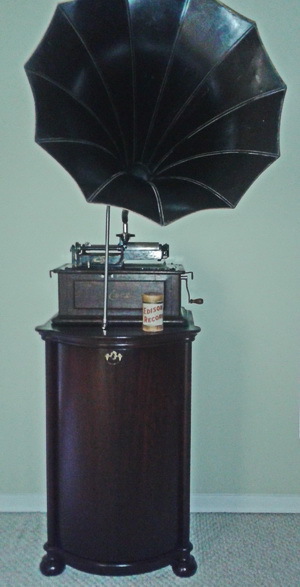 Up until then, early 1900 Edison machines had pretty much defined the entire category of antique phonographs to me. It was during this first visit with Mike that I had yet another ‘antiques phonograph first’: the desire to add to my own collection. Future visits with other CAPS members demonstrated this is the rule, not the exception. Next we brought my Edison, wrapped in a bathrobe cord to hold its broken wooden frame together, downstairs to Mike’s workshop to finally be examined by someone who knew what they were looking at. My first question, which had tormented me since I first opened the box: had I ruined the Triumph when I was unable to close it properly? Thankfully, Mike assured me that I hadn’t. The base-plate remained intact, it was only the wood that had been broken and that could be repaired. A tremendous relief! It would have been terrible if I had been responsible for destroying this incredible family heirloom. What had I been thinking, handling this over 100 year-old machine so carelessly? Finally, I could breathe and forgive myself. Internal cabinet horn found in the crate after unpacking. How did this get bundled with the other contents? Mike looked over the Triumph and confirmed that overall it was in pretty good shape. He pointed out the different parts of the player – the reproducer (mine had a Model O reproducer), the mandrel, the feed-screw, the brake, all things that are basic knowledge to an experienced CAPS member but new to me. Along with the upper pulleys having been converted to adjust the gearing for playing two- and four-minute cylinders, it had been modified to set it up for a cygnet horn: the original forward-angled carriage had been replaced with a horizontal one. Mike lifted the lid and showed me the lock/hitch in the Triumph’s base-plate hinge, the source of so much angst when I had been unable to close it properly. Inside, along with the ‘Voice Reproducer’ and little jug-like containers, was a piece that Mike identified as a Diamond B reproducer. He was also perplexed at the vast amount of metal flakes that coated the interior of the phonograph and its contents. There didn’t seem to be any broken or jagged pieces on the undercarriage, certainly nothing that would explain the flakes. I now had a better, albeit still rudimentary, understanding of the work needed to get the Triumph running again. Mike suggested two CAPS members, one of whom lives only about 20 minutes from me. Mike called up Don Woodrow, asked if he could help and fifteen minutes later I was off to see Don in Scarborough. 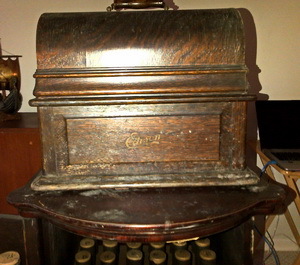 My association with CAPS had already paid tremendous dividends during my brief antique phonograph hobby time and it was thanks to Mike Bryan’s generosity. I found Don sitting outside on his porch. He had recently been released from the hospital, was on the mend and invited me inside. As Mike’s collection of antique phonographs was museum-worthy, so was Don’s but in a slightly less polished way. Dozens of machines populated his basement in ramshackle fashion, in various states of perfection and repair. Every tool that could conceivably be used to fix an antique phonograph lined the walls. Horns of varying sizes and colours were scattered throughout the rooms. I had come to the right place. Don gave my Triumph a quick look-over, lifted the baseplate …. and solved the mystery of the metal flakes! It was graphite that had likely been stored in one of those metal milk-jug-like containers. Don went on to explain that the Triumph B has three springs which makes working with them trickier than single-spring machines. With Don recovering from blood poisoning, the last thing I wanted was for him to get sliced by a razor-sharp spring covered in a hundred years of grime from my Triumph. It would take a month or two to get it running again but after decades of silence, another couple of months would be no problem. I told Don to take his time. 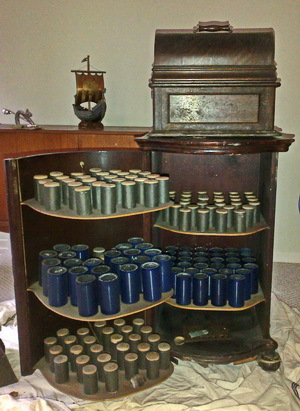 Cylinder shelf of cabinet, after the restoration. Some of the titles are visible. With both the Triumph and the mahogany cabinet under repair, I could only wait...and join CAPS. My first meeting was the annual Show and Tell where members brought in some of the unique pieces from their own collections. Some really, really interesting stuff was shown and again, the depth of antique phonograph history and knowledge was on display. Prior to the meeting, I asked a few members about cleaning my old cylinders; just a soft, damp cloth and some elbow grease – but don’t get the inside wet! It was an enjoyable and helpful first CAPS meeting. Over the next few weeks I cleaned about fifty-five cylinders, and was absolutely amazed when in many cases the white lettering would pop into focus revealing names and titles from a century ago – fascinating stuff to a music fan like myself. I had heard of “By the Light of the Silvery Moon” and “Sweet Adeline” but for some reason it felt surprising that so many titles were unfamiliar. I had recently come across “Nearer My G-d To Thee” when reading about troops marching through no-man’s land during World War I, so that one stood out. I wondered what “The Edison Choir” sounded like. I was more excited than ever about having a working Edison Triumph Model B so I could listen to all of this new old music! At a later CAPS meeting (one in which I won the 50/50 draw, I might add) I spoke with Don who was having some additional medical issues which were hampering his repair efforts. He suggested I get in touch with Angelo Raffin who might be able to take over. Angelo was the other person who Mike Bryan had initially suggested to do the repair work. With such impeccable references, I gave Angelo a call and, a short while later, brought the Triumph from Don’s to Angelo’s. 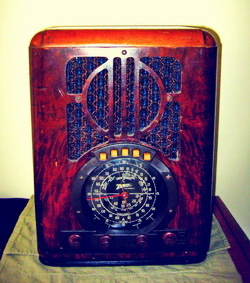 The 1938 Zenith wood tombstone radio that I bought from Angelo, the second piece in my collection. Angelo examined the Triumph – nothing jumped out at him as seemingly problematic to be repaired – and thought he’d be able to get it working in a week or two. I mentioned that I was also looking for a cygnet horn and crane: of course, Angelo had an original cygnet available and once again, I was excited to envision my Triumph working, this time with this beautiful horn. It was at this point, though, that Angelo realized that even though the original forward-angled carriage had been replaced to take a cygnet horn, there were no holes drilled for its back bracket. I had a choice. In order to complete the old conversion, Angelo would need to drill holes in the back of the case to set up the back bracket, crane and cygnet horn. Alternatively, if I wanted to maintain the Model B as originally purchased, I would need to consider replacing the horizontal carriage with a forward-angled one, replacing the reproducer with one appropriate for the horizontal carriage (such as a C reproducer) and then get either a self-supporting witches-hat horn or a morning glory horn and crane. Not having been aware of the modifications to the upper pulleys and gearing that had been made to play two- and four-minute cylinders, as well as replacing the carriage to support a cygnet horn, my initial plan was to keep the Triumph as close to possible as originally sold. However, the old conversion efforts had me reconsidering. I preferred to have a carriage that my great-grandfather had used rather than replacing it with one that was more in line with the original purchase. As well, I was still scarred from damaging the case and couldn’t bear the thought of inflicting any more on it. So while the cygnet horn was beautiful and would take up less space in my home (extending upwards from the back instead of out wards from the front), I decided, along with Angelo’s reticence about drilling holes in this antique, not to drill. Angelo suggested a 45-degree swivel elbow that would connect the reproducer to the witches-hat which would also eliminate the need to replace the horizontal carriage. The most pressing decisions made, I headed home and looked forward to hearing from Angelo in the near future. The very next day, I received an e-mail from my uncle (mother’s brother) with a picture attachment. I had been talking to him about the restoration efforts and he mentioned that he had seen a picture – perhaps somewhere in his collection – that had my great-grandfather in it. Also in the picture was a phonograph, possibly even the Triumph Model B itself! He had found the picture, scanned it and sent it to me… and it was better than I could have hoped. I hadn’t known, or at least, hadn’t paid enough attention when in the past I was told that my great-grandfather, Jacob Robinson (on the left in the picture, wearing a black bowler) owned a store in Portland, Maine, that sold amongst other things, phonographs. 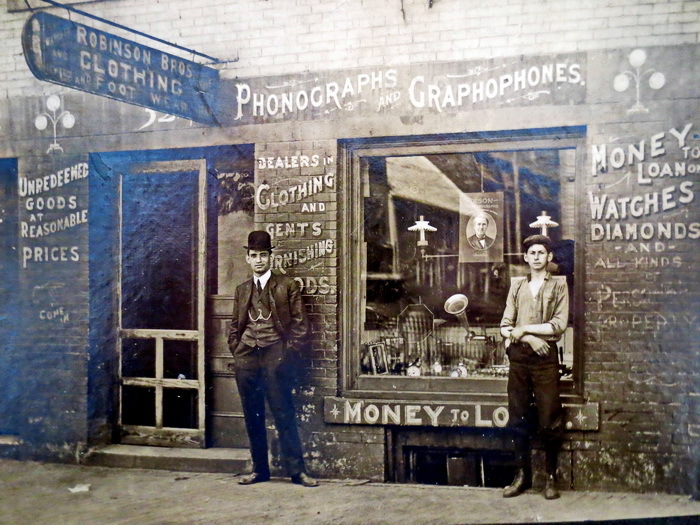 There he was, with his younger brother Ben, standing in front of the Robinson Bros. store, with a big “Phonographs and Graphophones” sign above the window. After studying the two gentlemen and noticing no family resemblance to myself whatsoever, my eyes were drawn to the two machines in the store window. It took another minute or two for me to clue in on the Edison sign hanging above them. Incredible! “Robinson Bros. Clothing” - Jacob Robinson (L) and Ben Robinson (R), Portland, Maine, USA, ca. 1908. I forwarded the picture to Mike as I thought he might find it interesting. Shortly after, I received a reply: he had forwarded the picture to Bill Pratt who then got in touch with me. Perhaps this photo could be used as a cover? Would I be able to provide any history of the men and the store? If so, the photo would be even more interesting. Yes and yes! I was flattered that Bill thought other CAPS members might be interested in seeing the photo and found it funny that 75 years after his death, my great-grandfather might be a cover boy. After studying the photo for a bit, Bill identified the machine on the left as an Edison Gem, due to the recognizable 8-panelled black horn. (Bill noted that he could see the chain at the top which suspended the horn from a crane and, I quote, “If I really use my imagination I would say that the phonograph lacks an end-gate which would date it to 1908 or later.”). The machine on the right has been identified by Mark Caruana and Mike Bryan as an Edison Standard, most likely a late model B. The horn, however, is not an Edison horn but rather an aluminum Columbia horn which initially made identifying this machine’s make more challenging. 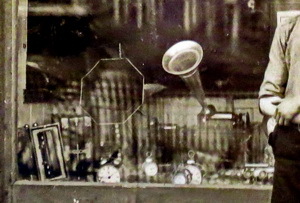 Detail of the two machines displayed in the Robinson Bros. store window. Bill also put me in touch with Arthur Zimmerman, the text editor for the APN, who wrote that “an article about the ‘recovery’ of a family heirloom p h o n o g r a p h , complete with family histories and the full complement of recordings that an ancestor acquired and listened to over a hundred years ago… could be very exciting to us collectors and aficionados”. While I certainly thought this link to the past was interesting, this was the first time that someone who didn’t have a proverbial ‘horse in the race’ might as well. Arthur also suggested that if I could provide additional information – as to why they chose and liked the musical material and how it may have related to their life histories – it would give additional depth to this piece. Unfortunately, Jacob Robinson died in 1944 – only a couple of years after my mother was born – and I haven’t come across any other relatives who can tell me much about his preferences. Due to the genealogical documentation efforts of other family members, however, we do know some about both Jacob and his younger brother Ben. Jacob Robinson was born 1880 in Kowel, Russia. In 1893, he immigrated to Portland, Maine, USA. The 1900 United States Federal Census listed him as ‘single’ so he married sometime between 1900 and 1906, when his daughter was born. In 1909, his son (my maternal grandfather) Irving was born. Jacob died in July, 1944. Ben Robinson, my greatgreat- uncle, was also born in Russia, in 1892, and came to Portland in 1893 with the family. After graduating from Harvard University in 1915, he moved to Montreal and in 1948, Benjamin Robinson became the first Jewish member of the Montreal Bar Council. In 1959, he was appointed as Judge of the Superior Court of the District of Montreal in Quebec. He died in 1969. While I was able to find a fair amount about the life of my great-great-uncle Ben, I was not as successful uncovering information about my great-grandfather Jacob. From a family blog, we know that Jacob and Ben Robinson had a store in Portland, Maine, called “Robinson Bros. Clothing”. My grandfather recalled that “….in the window of the store was an old Edison phonograph and that Jake also ran a dance hall upstairs over the store”. Around 1915, Jacob moved his family to Montreal and along with other family members established the Canada Broom Supply Company. Edison morning glory horn after restoration was complete. The points above, regarding the Robinson Bros. Clothing Company and the Canada Broom Supply Company, provide some clues for dating the photo. Since … - I know the Robinson Bros. store was in Portland, Maine - The brothers didn’t emigrate from Maine to Canada until approximately 1915 - Ben Robinson was born in 1892 and in the picture he looks about 16 or 17 which would be circa 1908 - Bill Pratt wrote about the Edison gem in the picture: “If I really use my imagination I would say that the phonograph lacks an end-gate which would date it to 1908 or later.” ...we might therefore assume the picture might have been taken around 1908 or 1909. As well, the above points provide some additional information about the Triumph Model B. Earlier, I mentioned that our family thought it was possible that one of the phonographs in the photo was the Edison Triumph Model B. As that is clearly not the case, however, I wonder now whether the Triumph was used in the dance hall that Jacob apparently ran above the store, or if it was his ‘family machine’. Not being familiar with almost all of the titles, I’d hazard a guess that the Triumph was Jacob’s personal phonograph for two reasons. 1) There are only 55 cylinders - would that be enough to run a dance hall? 2) While the majority of the titles seem to be songs popular at that time there are still quite a few that appear to be religious in tone and not really dance-hall appropriate. 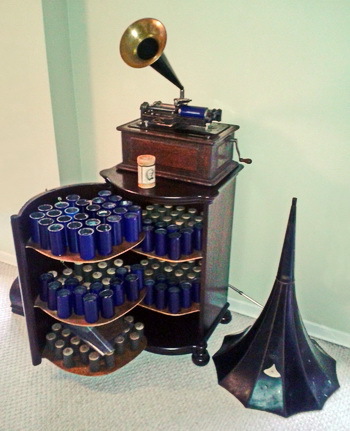 It’s possible that he could have combined some of one collection with another (maybe he had 2 phonographs, one at home and one at the dance hall) but for now, I believe the Triumph and the cylinders were his familial machine. About a week and a half after dropping the Triumph off with Angelo, he told me that it was ready for pick-up. Angelo demonstrated how to use the Triumph - I had never operated one before. I had decided to get a 14’’ witches- hat horn as well as the morning glory horn (along with a reproduction crane that he had manufactured), so Angelo showed me how to set both of them up. He also swapped the reproducers so I could listen and choose which one sounded best. After listening to the O model, the Diamond B and then a rebuilt Diamond B from Angelo’s collection, I chose the rebuilt Diamond B. I’ve talked to a couple of people since then and some thought I should have gone with the O model. By then, however, I knew that I wanted to listen to Jacob’s music collection with the best sound possible; the music lover in me demanded it and I was confident that Jacob would agree with my rationale. I also had no intention of changing the gearing to play two-minute cylinders (I didn’t have any of those, regardless), so that point was moot. And with the exception of CAPS members and other antique phonograph enthusiasts, I doubt anyone else would notice that even though the Triumph’s gearing had been converted to play two- and four-minute cylinders, the rebuilt Diamond B reproducer I was using was not compatible with two-minute ones. I swapped my extra parts to Angelo for the horns, cranes and in consideration of the effort he had put in to make the Triumph cleaned up and working again. Keeping these extra parts would have been a waste on my end: I’m happy they are with someone like Angelo (or Don) who can put them to use and potentially give another newcomer to the antique phonograph world a chance to experience the same enjoyment that I have. Edison Triumph B with horns after restoration. One week after I picked up the Triumph from Angelo, I hosted a small family gathering including my Mom and my uncle. As we drank our coffee and listened to “Everyone Two-Step” and “The Mocking Bird-Fantasia (Xylophone)” (the first part of which was recognizable as the opening in “The Three Stooges” theme song), the presence of my great-grandfather and great-great uncle joined us: music had transcended time. Not all the cylinders are playable: I brought “Nearer My G-d to Thee” to Angelo’s when I picked up the Triumph, in hopes that we could listen to it. (For whatever reason, I have a feeling that one was a favourite of Jacob’s, but of course, I’ll never know.) But the inside of the cylinder was chipped and Angelo suggested that we not try and play it (presumably so as not to damage the mandrel). But whether I am able to hear them all or not, the gift that was given to me first by my great-grandfather and then by my grandfather, has been gratefully received. I like to think Jacob felt the same joy buying these cylinders, as excited to get home and listen to them, as I was when I bought my own vinyl and CDs. The crate sat unopened for close to fifty years. Its contents spanned three centuries of our family history and continues to enrich our lives today. *The author would like to express his thanks to Arthur Zimmerman for his advice and assistance with this article.